The unveiling of our product is here! The beginning. The breakdown. The end result. When I first thought of creating a unique product that most of us have never seen, I had this romantic notion that it could be displayed at KALEID alongside other cool and distinctive art. Not having a clue what the requirements were on how to get my art displayed, I decided to tackle this challenge with enthusiasm anyway. I was always the type of pup that preferred to aim high and miss than to aim low and hit. Because of the many talented artists and creators, it will be difficult to get in; however, I am more than willing to come out head first against this challenge. Soon, I internally exploded with a crazier thought. I fantasized Starbucks purchasing my product and using it throughout their Bay Area stores. Unrealistic? You may think so, but my aspirations convey the opposite; you might as well shoot for the stars, right? Maybe one day, while you are waiting in line to order your executive coffee and Double-Smoked Bacon sandwich, you'll recognize it when you look down and live a vicarious thrill of my grand desire. Stay observant my friend. Woof Woof! The idea of crafting a versatile, easy-to-use, and eye-catching product stems from a long time ago when I was a puppy aimlessly wandering the shoddy streets of Downtown San Jose. During stormy seasons most streets get gross and messy, soaking my feet and turning them filthy with mud, tiny pebbles and dirt inside the crevices of my paws. Going from beautiful and clean to dangerous and dirty in a split second. I couldn't afford puppy paw shoes at that time, and because of this, I didn't want to get anyone's home dirty. Rubbing salt to the wound, whenever I got invited to movie nights with my friends, I had no other choice than to reject the invitation. Alone at my house, I would wonder if they chose my favorite movie that night, Good Will Hunting. I felt sad, upset and embarrassed. I wanted to go see about a girl. Right after these moments, I wanted to create something different yet useful for every puppy in town to utilize in their home. Something to resonate with my style and personality, and a product that all my pup friends would be proud of. Immediately, my idea was to turn something average into spectacular and to captivate those with the curious eye; to awe those who first saw it when they stepped their paw/foot in the door. Undoubtedly, a different product that we wouldn't see in any store, and most certainly not at your local Salvation Army (We hope it never makes it that way!). I knew I wanted to use wood from the get-go. Remember these wooden projects we made? Click to learn more. 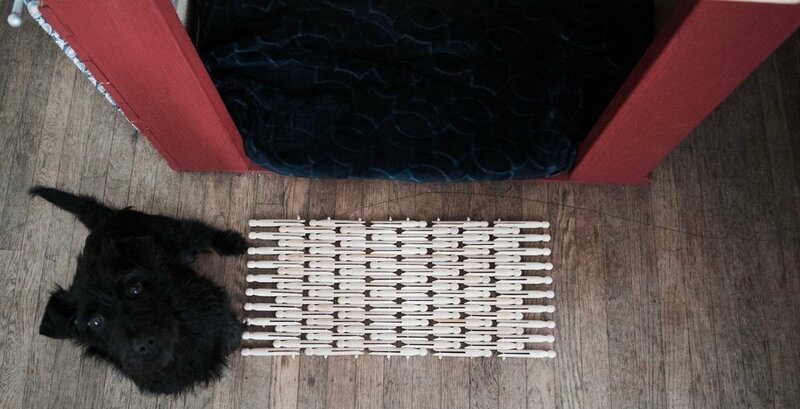 The only versatile decorative mat your furry animals will ever need. You see, this isn't your regular rubber ducky plasticky fiber mat you find everywhere. This mat has character, charm, and handsomeness all over it. If it had a heartbeat, I would make it my (b)itch! AND it doesn't stop here! We built one for my human friends to place in their lovely homes too. And let's get something straight here. Although it can be used anywhere inside or outside your living space, this mat originally was designed to be placed in the smack entrance to your exquisite home and welcoming guest by saying, "Look at me, I am different and I am proud of it." Frankly, this decorative mat wasn't created to be picking up dust on the shelves at your local Target, World Cost Plus and no less, Ross. I like Ross by the way. It's where I usually find toys for a banging good deal. This mat needs to be in your shopping cart while you smile ear-to-ear knowing you are about to purchase something only a few wish they could have. Almost like embarking on a once-in-a-lifetime journey with your dream date to your wild, unimaginable self-made utopia. Privileged? I think so. The larger mats are finished by adding 8mm wooden beads at the ends. 6mm wooden beads are added for the smaller mats. We believe the size of the beads is a perfect match for the mat sizes. Just like the matches you get on those apps swiping right (Don't act like you don't know what I'm talking about!). Except, these beads are natural and look authentic, unlike those who alter their photos and when you meet them in person, it's almost like you met their 1st cousin. Even worst, their 2nd cousin. Could your night get any better? Best of luck. You can also choose not to add beads at the end. 1 - Our product is different. We have yet to see anything similar to it and that is partly a reason it is unique. You see, we don't want to glue, put a price and sell (Nothing wrong with that). We want to put something together by hand with lots of love, representing who we are. It's unique in almost every way. 2 - It's easy to manipulate, easy to store and easy to clean up. 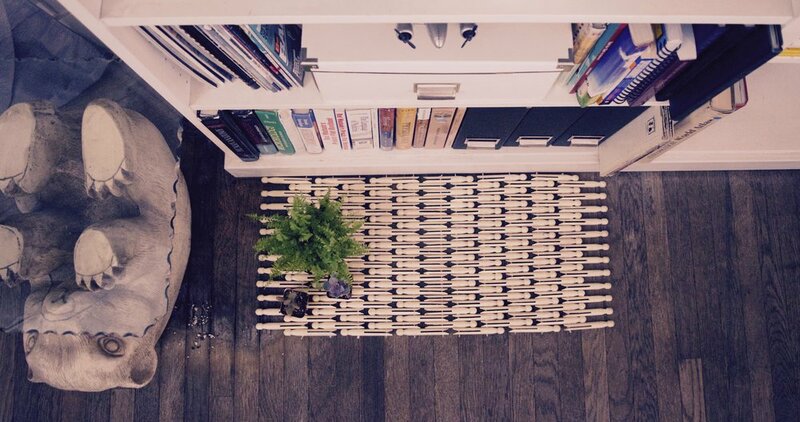 This decorative mat is so versatile you can use it in many ways. Our Etsy shop will be open sometime soon for those interested buying from the Etsy platform. Hopefully, this will help us navigate through the millions of ever-changing infinite web markets. Like anything in my life, we will need a vast amount of time, prayers and patience to call this a success. Click our Shop section to scope the details of the products. Lastly, share this post with your friends, with your family, bf's, gf's, ex-bf's, ex-gf's, your pets, your neighbors, your co-workers, the gardener, the pool boy/girl, the librarian, the train conductor, the priest, the bouncer, the bartender, your classmates, your teacher, your gym buddy, your computer, yourself, etc. I think you get the point. Thank you so much for your patience and stay tuned for some updates on Molly, more product ideas and our final few months in San Jose.